Some people suggest changing the order of the user_pref("mail.accountmanager.accounts") parameter but this did nothing for me. What worked instead was setting the user_pref("mail.accountmanager.defaultaccount", "accountx") parameter. Setting it will put one account at the top of the list - by repeating this process, you can order your accounts the way you want it! Just replace the number of the account (marked with x in the text above) with the one you want top. * Make sure Thunderbird is closed before editing the file or changes won’t be saved. * The default account will always sort to the top of the list, regardless of other changes. 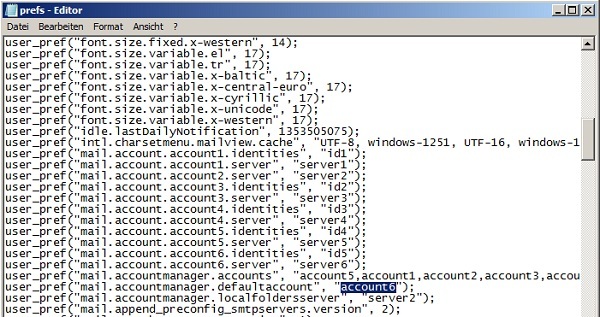 * The line “”mail.accountmanager.defaultaccount” sets which account is the default, and therefore which account will always sort at the top. * Your instructions say to replace the number of the account marked with an x. But no account in the illustration is marked with an x. * Your instructions imply making multiple changes to the .defaultaccount parameter by “repeating this process.” This is unclear since you can only list one account on this line. * You can also edit this file by going to Preferences (I think that is Options in Window). On the Advanced pane, select the General tab, then click the Config Editor button. Do a search for the desired line, then double-click the line to edit the value. Changing the order of the user_pref(“mail.accountmanager.accounts”) parameter worked a treat for me.